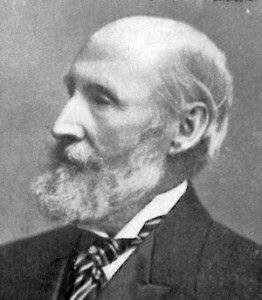 Edward Hull (1829-1917) was a famous Irish geologist who worked for the British Geological Survey for 41 years until 1891. He was Director of the Geological Survey of Ireland from 1868 and Professor at the Dublin Royal College of Sciences. He published his memoirs in 1910. Hull identified the Azores as possible remnants of Atlantis following the rising of sea levels around 9000 or 10000 BC. He commented(b) “The tradition of Atlantis ‘beyond the Pillars of Hercules’ can scarcely be supposed to have originated in the mind of man without a basis of reality”. Hull believed that Atlantis in the Atlantic deflected the Gulf Stream leading to the onset of the last Ice Age! It was over half a century before the idea was revived by other researchers such as Tomas and Muck. In 1890 he drew a famous time chart(a) some fifteen feet long, based on the biblical dating system of another Irishman, Dublin born Archbishop Ussher of 1650. What is strange about this is that while Ussher dated the beginning of the world to 4004 BC, Hull’s own writings were based on more scientific data. This same chart has been republished recently by Barnes & Noble and updated in a manner that has horrified creationists.